Sealing asphalt driveways is time consuming but necessary. As water permeates cracks in the material and settles down at the base, the strength of the base is compromised, resulting in the formation of potholes. Cracks filled with water are also an open invitation in the to damage from freezing in colder climates. When planning for sealing asphalt driveways (also known as "hot top" or "blacktop"), wait until the ground temperature is 45 degrees Fahrenheit or greater and no rain is expected for at least three days. 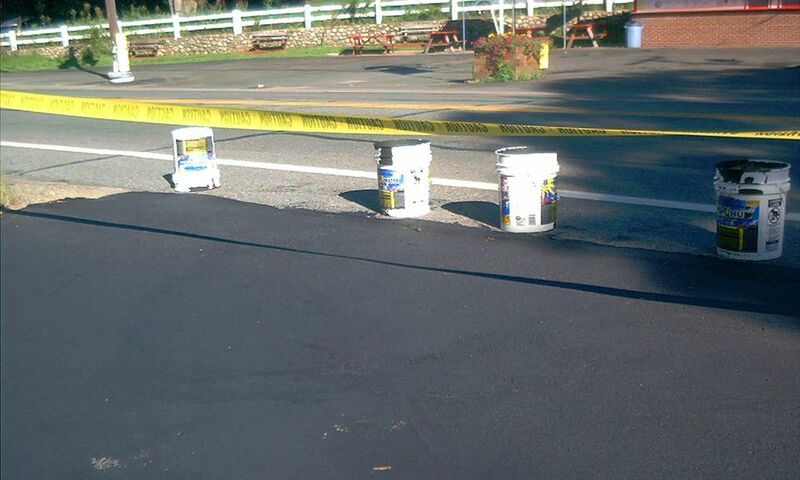 Much of the work in sealing asphalt driveways is in the preparation. That includes preparing your body for the job. Asphalt driveway sealers are rather unpleasant products, so avoid skin contact with them by dressing properly. Also, use a mask to avoid inhaling the vapors given off by asphalt driveway sealers (sealants). Grass overhanging the edges of the surface should be removed. With a stiff-bristled brush clean any oil or gas stains using a detergent specially made for this purpose, which can be found at auto supply stores. Sweep the surface clean with a push broom. Patching compounds are available at home improvement centers to fill in large cracks or depressions; if your surface is plagued with either, fill them in before continuing with Step 4. Follow label directions for drying time for these compounds. With the garden hose, hose down the surface with a vigorous spray to remove dirt missed in the sweeping process. A pressure washer would make this job easier and more effective, but it is optional. Allow the surface to dry. Well before prying off the lid of the tub of asphalt driveway sealer, turn it upside down. This will pre-mix the contents. Once the tub is opened, continue to stir periodically so that the sealant remains well mixed. Beginning in one corner, pour some of the asphalt driveway sealer on the surface. You will probably find it easiest to work on one small square section at a time (a section, say, 10-20 feet square) rather than doing long narrow strips. Apply your sealant in thin, overlapping coats with a long-handled application brush or squeegee. Drying time is a minimum of 24 hours, during which time you should not allow traffic of any kind on the surface, but especially automobile traffic. Place barrels at the entrance to your yard to prohibit vehicular access, or simply use the empty sealer tubs. For greater visibility, drive a post into the ground on either side of the entrance, and string some yellow construction tape between the posts. Putting on a thicker layer of sealant will not provide additional protection. Avoid the "more is better" pitfall, and follow the manufacturer's instructions. Asphalt driveway sealer should be applied within six months of installation then again every one to three years thereafter. However, a sealant should not be applied immediately after installation, as the hot top must cure for 30 days. In areas with harsh winters, sealing asphalt driveways once per year may be desirable, but beware the slick surface that will result.